Nippon demented Thrash schizoids FASTKILL brews up yet another ultra-blazing Thrash Metal at hurricane speed! 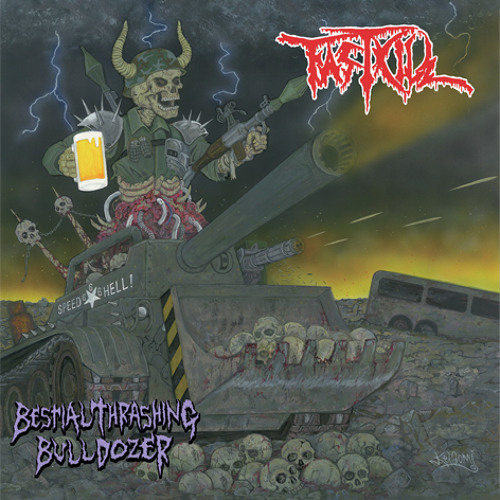 Utterly repulsive and dangerously fast, "Bestial Thrashing Bulldozer" is the group's first full-length album in four years since the equally deranged "Nuclear Thrashing Attack"; FASTKILL is indeed the first-class act in unmerciful rapid-fire Thrash-anity! Includes a cover song from Japanese cult Thrash band Nigarobo's “Endless Game”. Recorded, mixed and mastered by Keisuke Okada (Disconformity, Gridlink, etc) at Sound Studio NOAH, Tokyo and with the macabre artwork cover by Kei Gomi, "Bestial Thrashing Bulldozer" will literally cleave your head off with fiendish machine-gun riffs, nasty pounding drums and hellish morbid screams!